Included with the IRIS GPR is a comprehensive software suite - IRIS Software, which includes real-time GPR data acquisition, display and analysis capability for pavement and bridge deck evaluation. The IRIS Software represents the most advanced acquisition and analysis software for available today for ground penetrating radar. Radar Data Acquisition software with touchscreen control and real-time data viewing and data collection. This provides the user real-time viewing of GPR data as it is collected to internal hard drive. The intuitive software controlled user interface permits user to change gain, scan interval, channel select, filter functions, signal measurements, preprocessing functions, as well as DMI calibration and time-scale calibration functions. Waveform analysis software for concrete & asphalt evaluation, void & moisture detection. 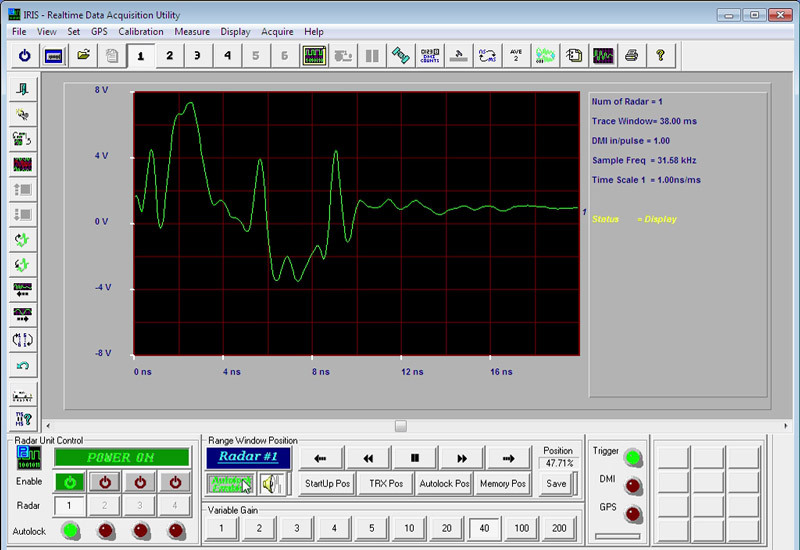 This software is unique in the industry and permits user measurement of signal characteristics such as voltage amplitude, power and polarity. Analysis files are provided in text or excel format as well as exported to IRISMap for 2D plotting in plan-view format. 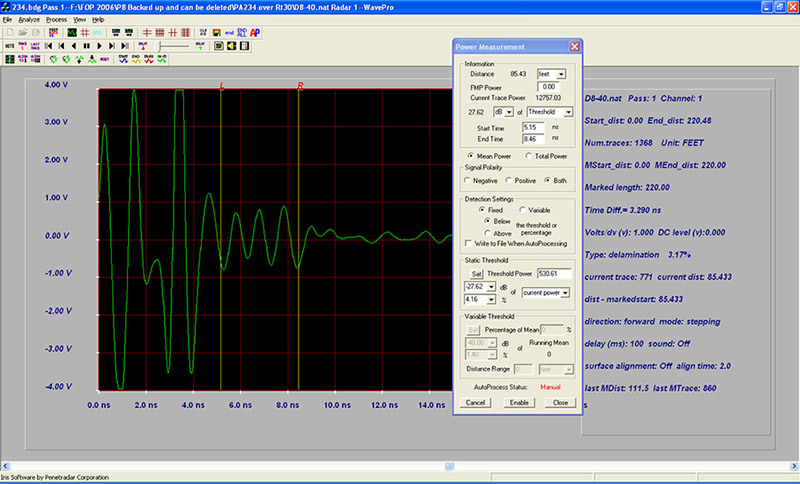 WavePro is used to analyze GPR waveforms and is a versatile program for measurement of signal features such as amplitude, power, polarity and time. This is used for many applications, such as detecting defects and concrete deterioration, voids and subsurface moisture. Pavement profile and layer thickness analysis software. 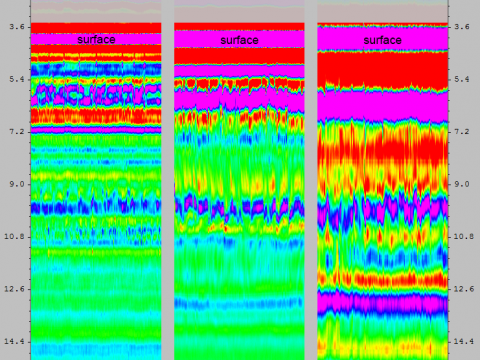 This advanced software shows GPR data in a colorized depth profile format. 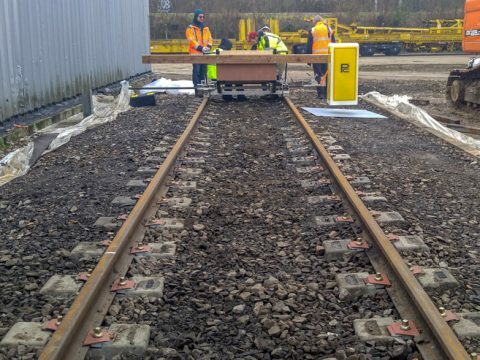 It performs measurement of pavement layer thickness (up to 5 layers at a time), calculates dielectric constant (or allows user input) and determines thickness. Thickness is calculated for multiple layers and presented in text or excel spreadsheet format relative to distance (DMI) or GPS coordinates. Analysis files can also be exported to IRISMap software for plotting in 2D plan-view (map) format. 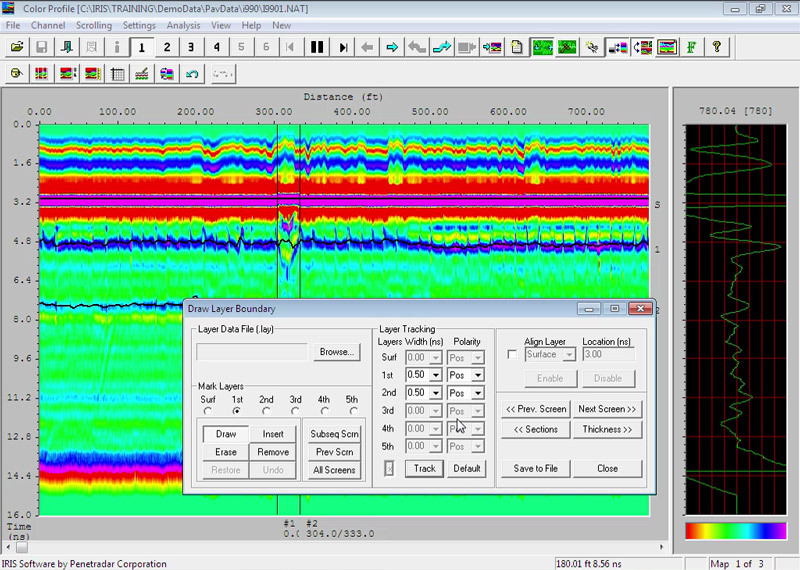 ColorPro shows raw GPR data in a semi-processed format as a color profile with corresponding GPR waveforms in the side panel. To analyze pavement layer thickness the pavement data are first segmented according to pavement structure. Then valid layers are identified and ColorPro tracks the pavement layers. Once pavement layers are marked, dielectric constants are calculated and thickness for the pavement section is determined. Layer thickness (for up to 5 layers) is then output in numerical and graphical formats relative to distance and GPS coordinates. Produces plan-view mappings of pavement flaws, layer thickness contours and bridge decks deterioration using processed data from ColorPro and WavePro software. IRISMap shows the results of the ColorPro or WavePro Software and produces color topographical, plan-view CAD maps of the pavement showing thickness, moisture (dielectric constant), voids or concrete defects as color variations.